Born and raised in Sylvester, Georgia, entrepreneur Mark Dykes experienced South Georgia’s prevalent passion toward high school sports early and often. After years of struggling to find the time to fully enjoy that sports tradition while pursuing careers in other fields, he eventually decided to take the leap of faith in trying to connect with the culture by launching In the Game High School Sports Magazine in 2007. With office locations in both Valdosta, Georgia and Jacksonville, Florida ITG Next has grown into a network of sports media and influence. Their lifestyle apparel clothing line “ITG Next” and print magazine publications are complimented by their constantly updating eCommerce website, seasoned TV show productions, social media engagement, frequent events, branded materials and weekly newsletter. Since 2015 our friends over at ITG Next have depended on Georgia Web Development for eCommerce website development and design services, website maintenance, support and updates as well as other digital based web services. 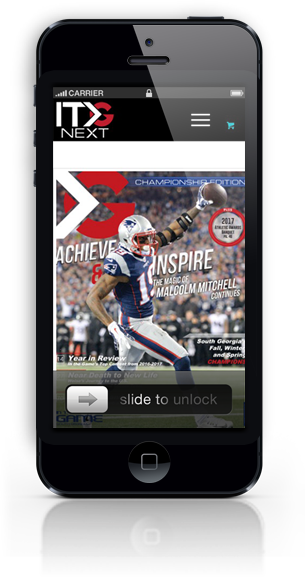 Being avid High School Sports fans ourselves our ongoing partnership with ITG Next has proved to be a natural fit. Our Complete eCommerce Website Packages Start At Just $1,995.00 | $997.50 down gets you started! As of 2018 we’ve developed and launched two large scale website projects for our friends over at ITG Next. Originally in 2015, In The Game’s old website was in need of a complete website redesign and website redevelopment. The site was running on an outdated Joomla CMS and needed a complete overhaul. We migrated the static text content over to a brand new custom WordPress CMS install running on a more robust server set-up and later introduced the WooCommerce eCommerce platform to the equation allowing them to set up shop selling everything from their magazine subscriptions to Pay-Per View video services. 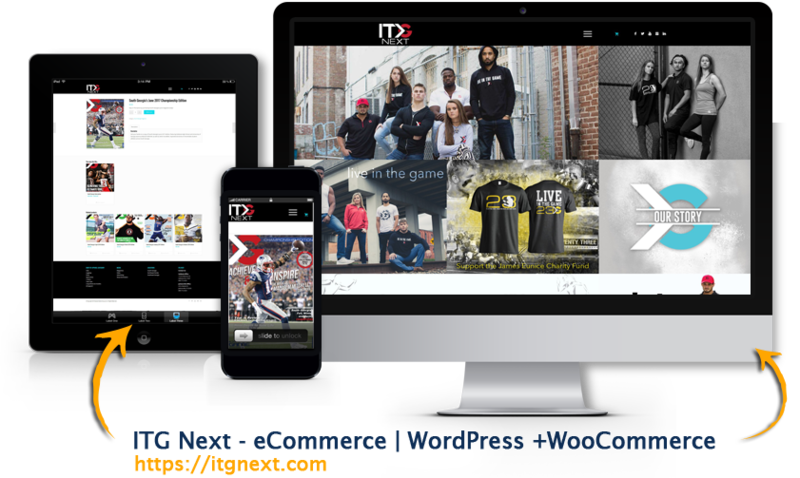 In late 2017 ITG Next was ready to move to the next level online as the company had recently introduced it’s own brand of lifestyle clothing and apparel. The newly redesigned and redeveloped eCommerce website would focus more on the ITG Next branded apparel while still maintaining it’s ability to feature and showcase it’s wide array of high school sports coverage. The new eCommerce website renders beautifully and flawlessly on all devices including mobile smartphones, tablets, and PC. It now features numerous custom eCommerce shop features like streamlined checkout for apparel and clothing purchases, magazine subscriptions, Pay-Per View video subscriptions and much more. Unlike many U.S. based website design and website development agencies do nowadays, we don’t out-source any of our web work overseas. We take great pride in keeping all of our web work in-house and in the good ole’ USA.